On September 17, 2007 “The Big Hurt” Frank Thomas proved that he still has awesome power by cranking out three home runs to pass Mel Ott on the career list, and then to move into a tie with Ernie Banks and Eddie Mathews with 512 career homers for the 18th spot on the all-time career list. Thomas homered twice off Boston knuckleballer Tim Wakefield, then hit his third against reliever Kyle Snyder to help Toronto cruise to a 6-1 victory over the first place Red Sox. Thomas had three homers one other time (also against the Boston Red Sox, but while playing for The Chicago White Sox). During that outing on September 15, 1996 at Fenway Park, Thomas hit all three home runs off of Wakefield on at Fenway Park. Regarded by many as one of the best pure hitters in baseball's history, Thomas is the only player in major league history to have seven consecutive seasons of a .300 average, a .400 on-base percentage, a .500 slugging percentage and at least 100 walks, 100 runs, 100 runs batted in, and 20 home runs (from 1991 to 1997). Editor’s Note: Thomas hit one more ‘07 home run (on September 25, 2007) to take exclusive claim to the 18th spot on the all-time home run list with 513. In addition, the possibility still exists that Manny Ramirez (490 at time of writting) will go on a season-ending tear and hit the 10 more round-trippers that he needs to surpass the 500 home run mark. 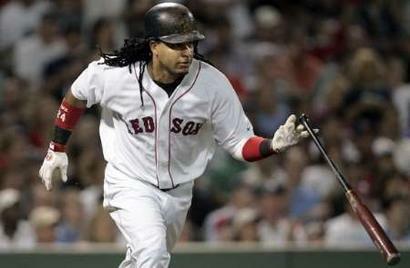 Even if he doesn’t make it to the 500 mark this year, the 35-year-old Ramirez is certain to do so next year.